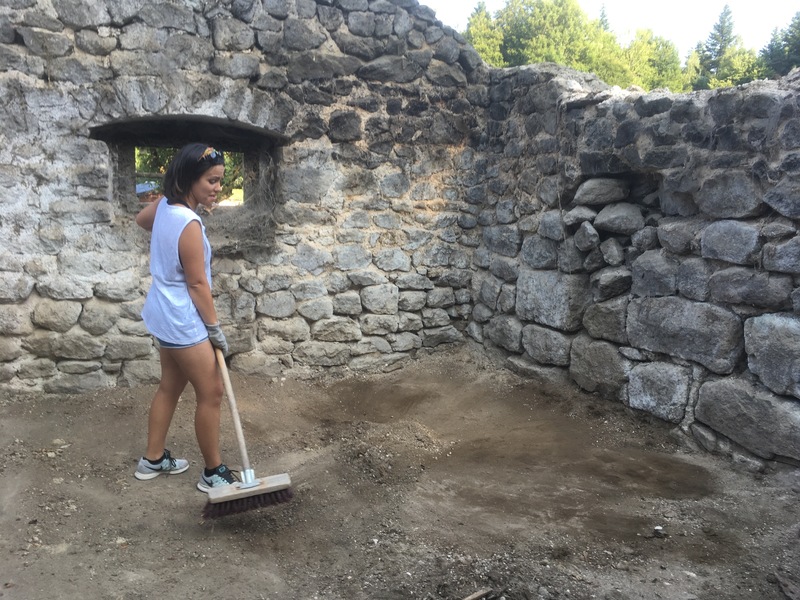 Summer is well underway and we have so much to report! 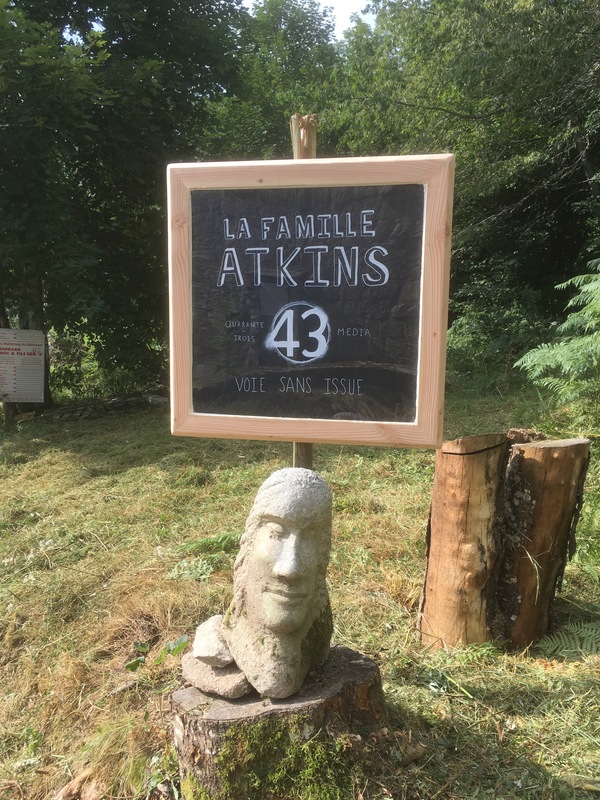 So Arty got his Bac – with a Mention Très Bien – what a total hero. Cass, his girlfriend also got a Mention Très bien … clever, hardworking pair! 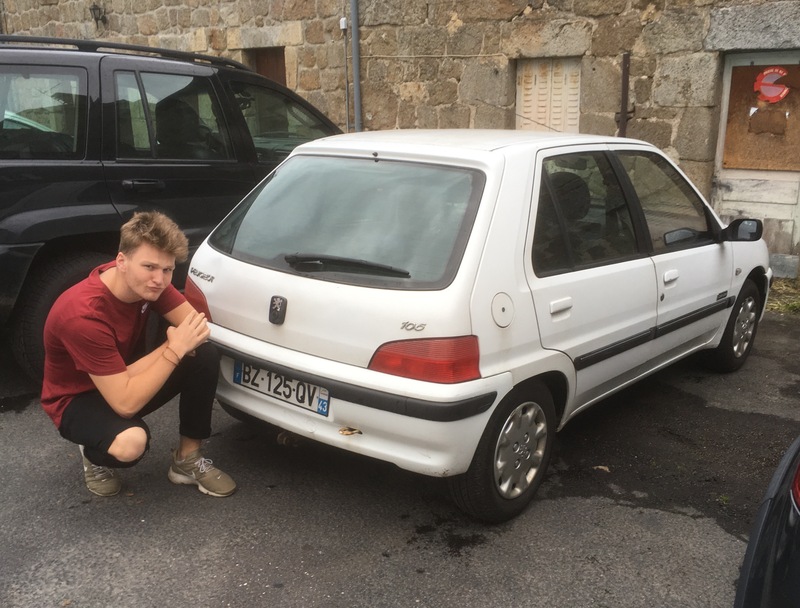 He’s bought a great little car and is now working for a few months in a local factory to earn a bit of cash to go travelling before starting uni next September 2019 to study Law. 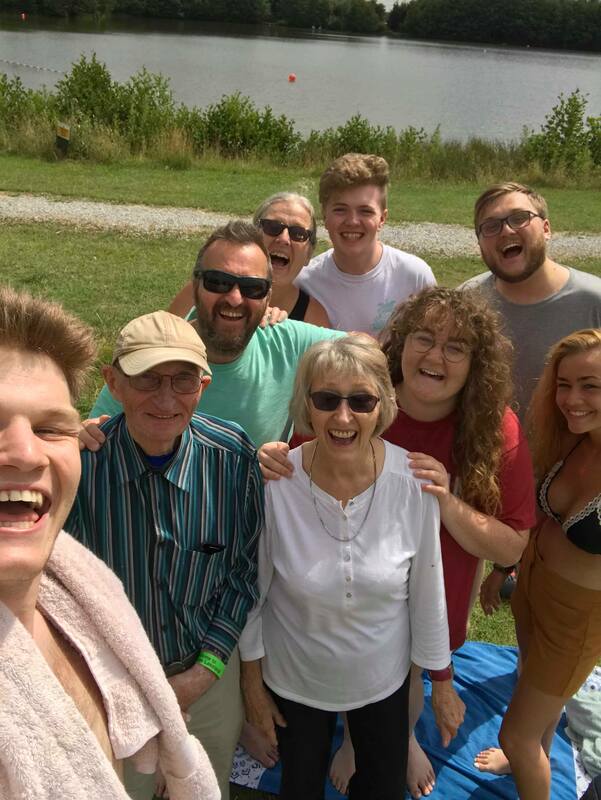 With all the exams and school finished, the whole family, including partners, took a whirlwind trip to the UK, principally to catch up with my Mum, and Joe’s Mum and Dad, but also to see all the family who were free to meet up. 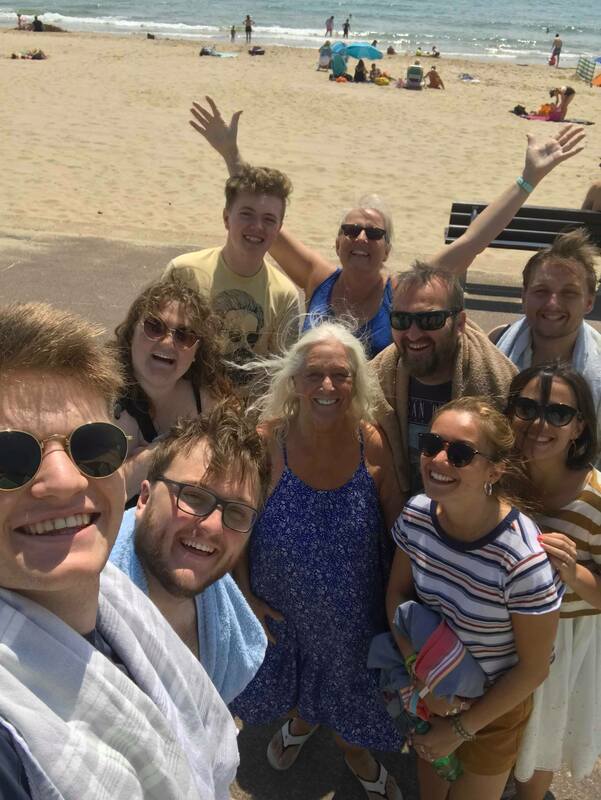 It was a brilliant few days, first by the sea in Bournemouth, and then up in York – so lots of driving, (even though we flew to England), and you know how we love a road trip! 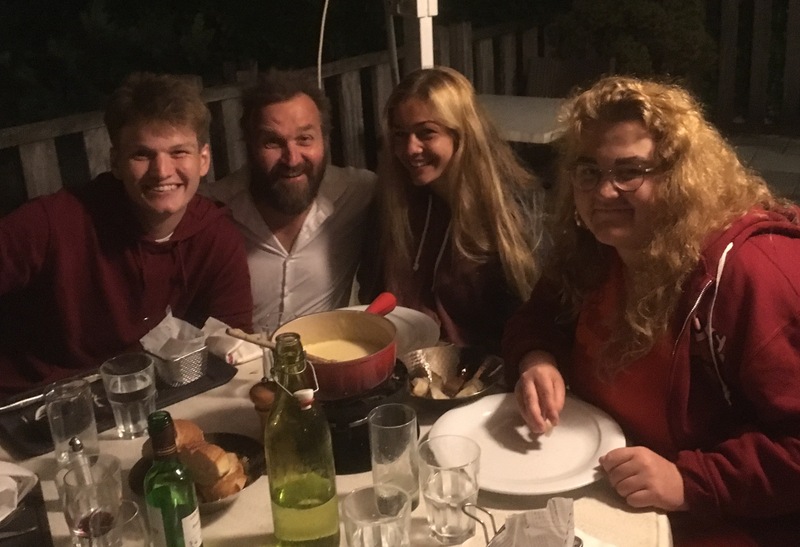 And – Oh the joy of having all my babes under the same roof! Oh where to start! Things are really moving a pace! 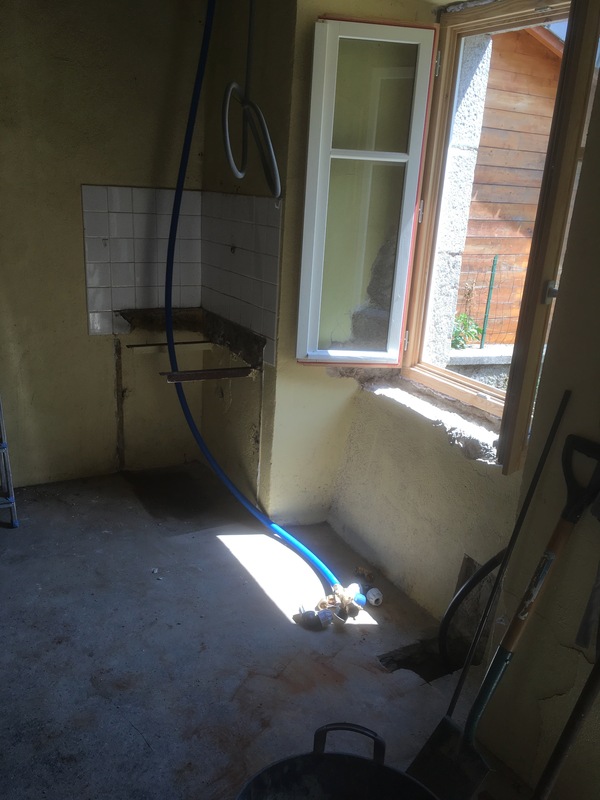 We’ve plumbed our house ourselves! Hot and cold – and our new boiler all ready to be installed – just waiting for the tank to be delivered. 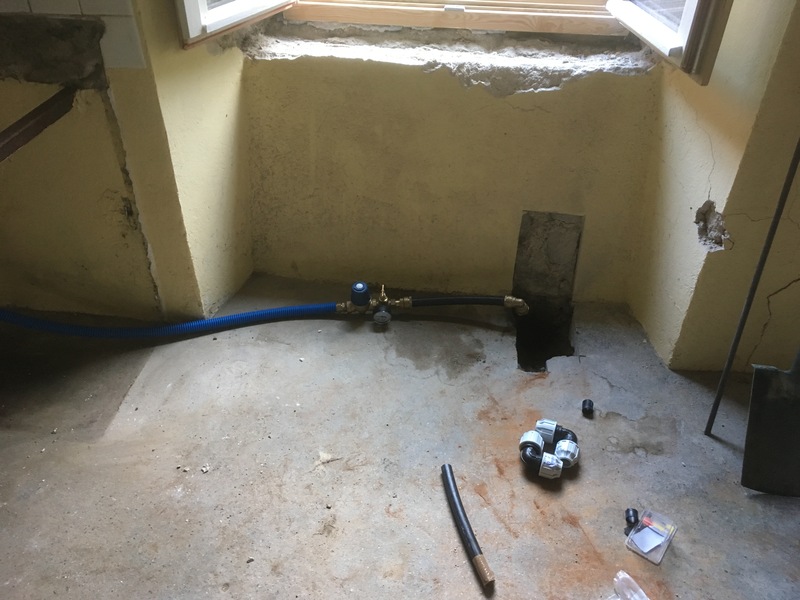 A few weeks ago, our friendly local plumber connected us up, and tested the system with us, checking the cold water pipes as they ran the water all over the house. And over the next few days we tested the hot water system too. There were, of course, one or two little leaks to deal with, all tightened up and checked now. We are over the moon!! This was a huge deal for us. 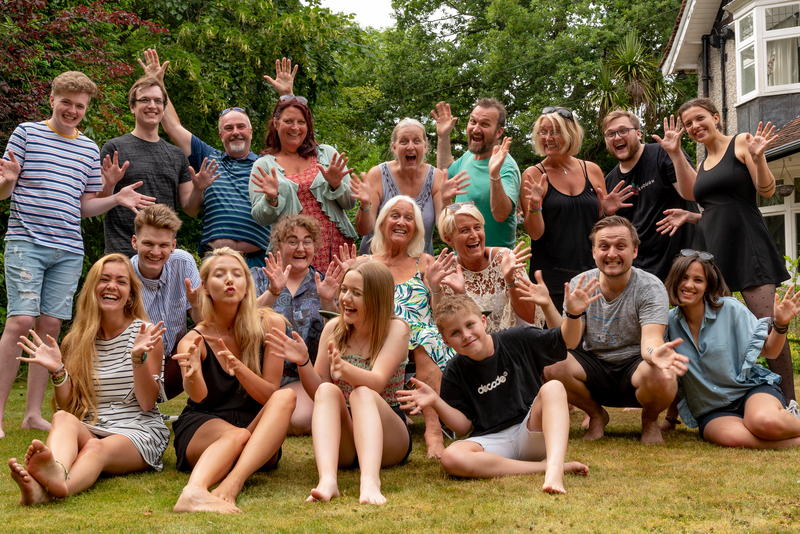 We made the bold decision to do it ourselves – quite a gamble! But luckily it seems to have paid off! 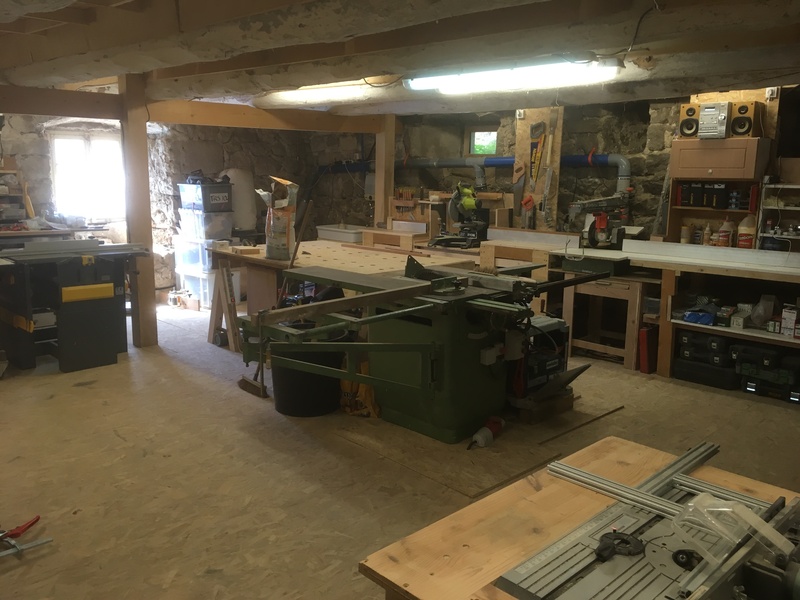 New home in the workshop! 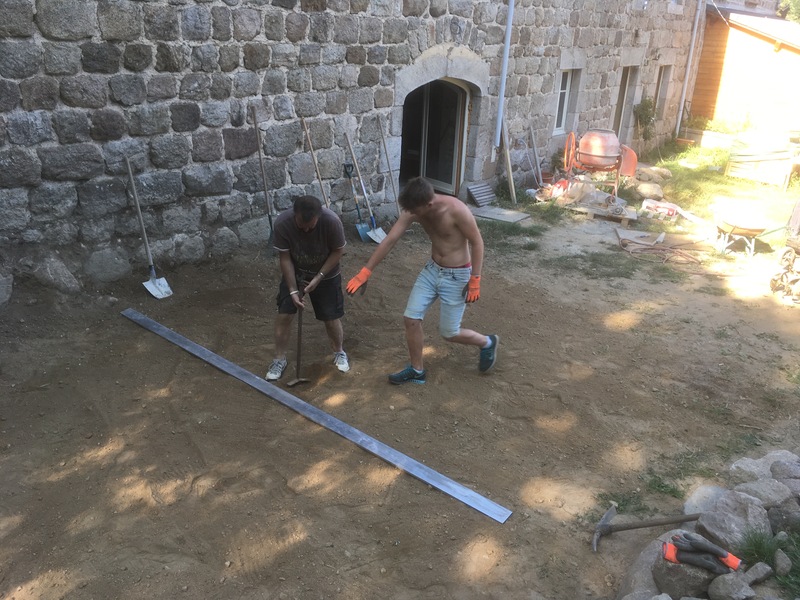 Before that, we drilled a big hole through our thick stone wall, at an angle to make sure it’s well underground on the outside (so it doesn’t freeze in winter); the 25mm pipe was then fed through the hole in the wall. Not an easy space to work in! 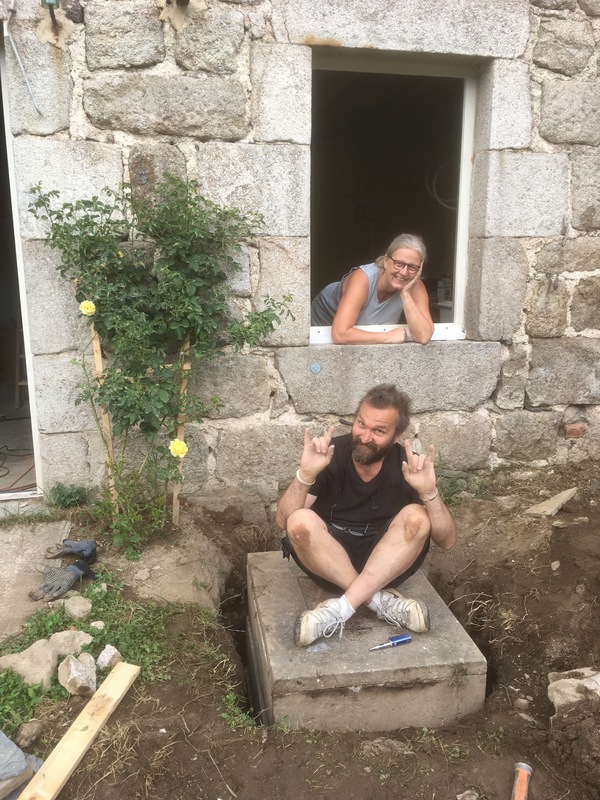 The old tap from the town supply broke while we were working on it, meaning we couldn’t turn it off completely. 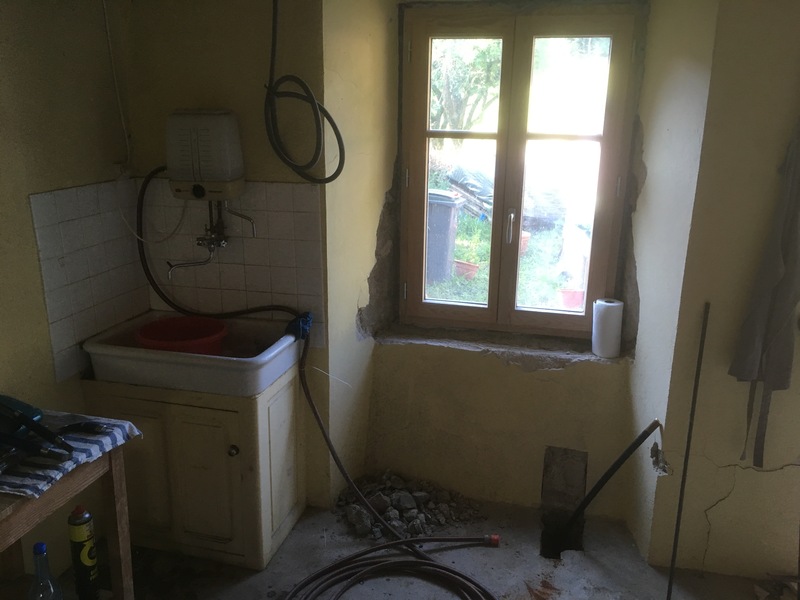 We rang the Mairie who said they would let the water department know and call back. Within about ten minutes, a charming guy was strolling round the corner to change the tap. 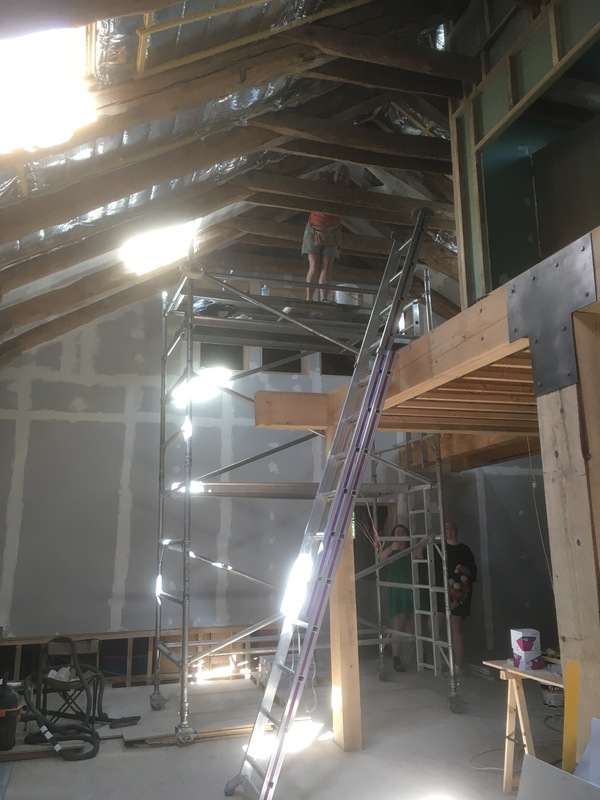 He stayed for about two hours – took a tour of the house, had a beer and gave mountains of advice, and filled us with confidence with his appreciation of our handiwork. And we are connected! 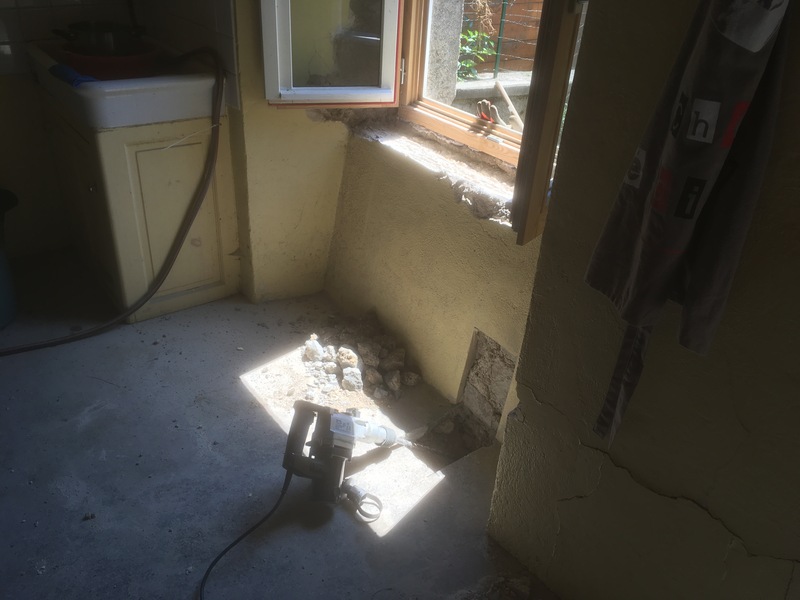 We will build a little window seat to house the regulator and mains tap. 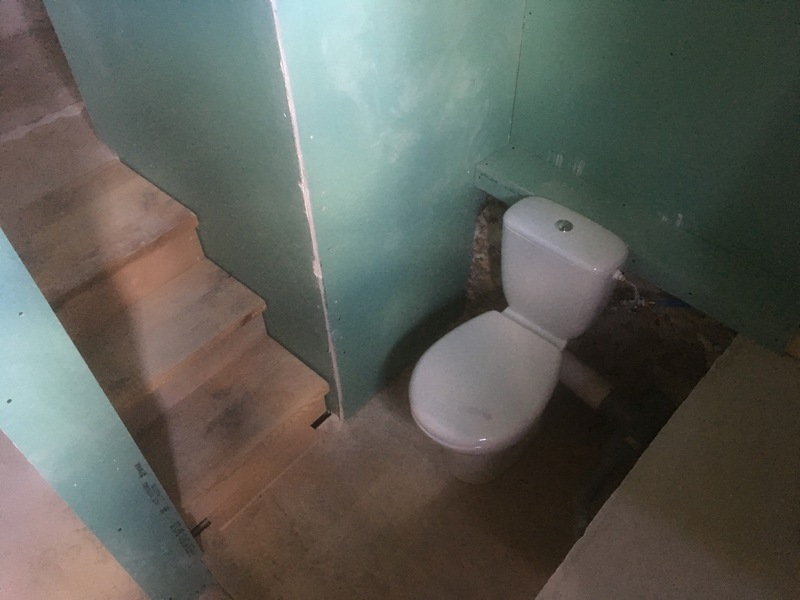 Having decided to put the ambitious and original downstairs bathroom a little further down the list of priorities, the imminent arrival of six uni friends of Beth prompted Joe to install the loo. 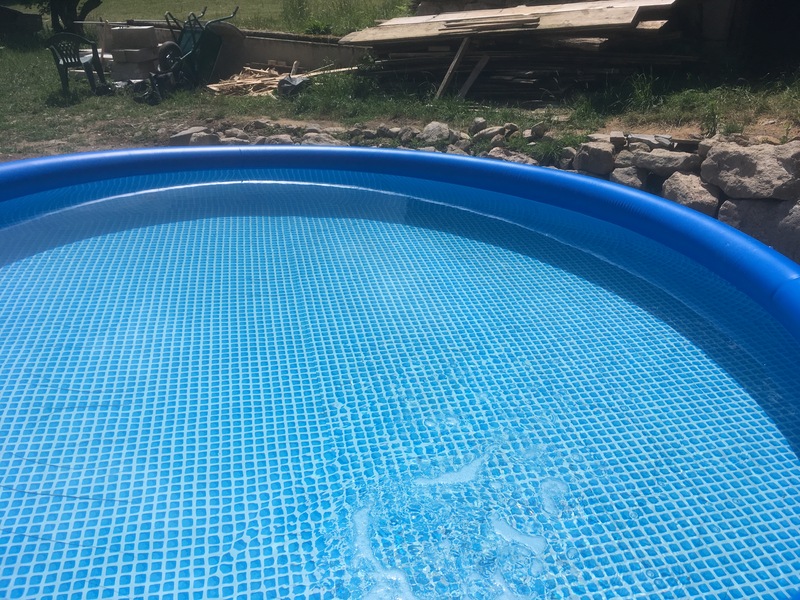 Now connected to the water of course! In fact we have two flushing toilets! 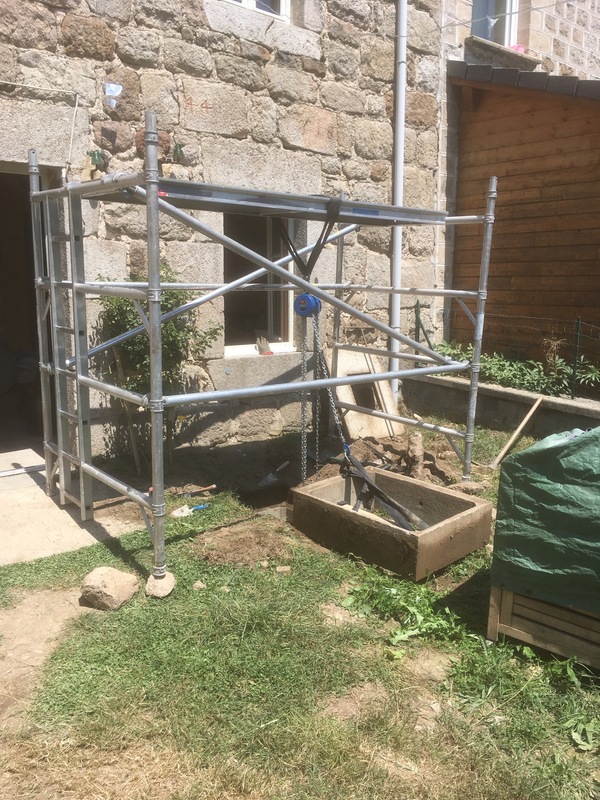 (admittedly one’s up quite a big ladder!) 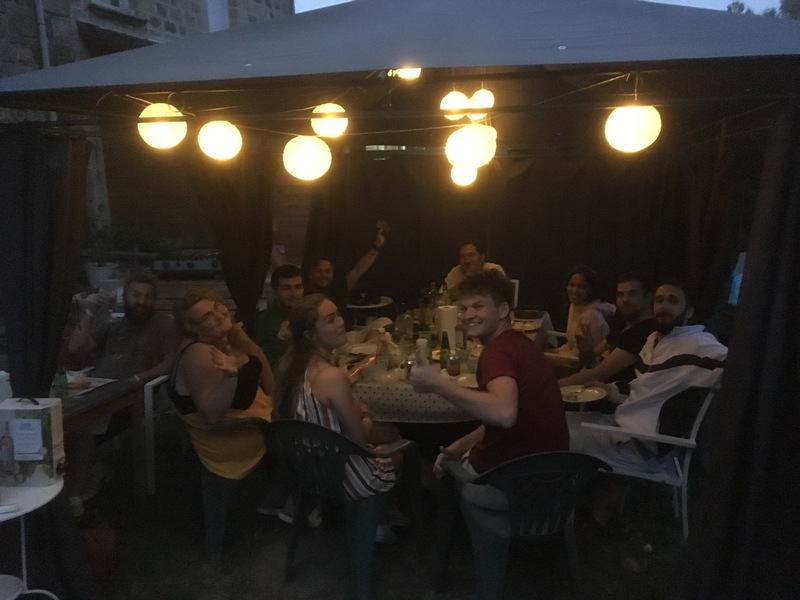 The fosse septique is being properly inaugurated with our increased numbers! 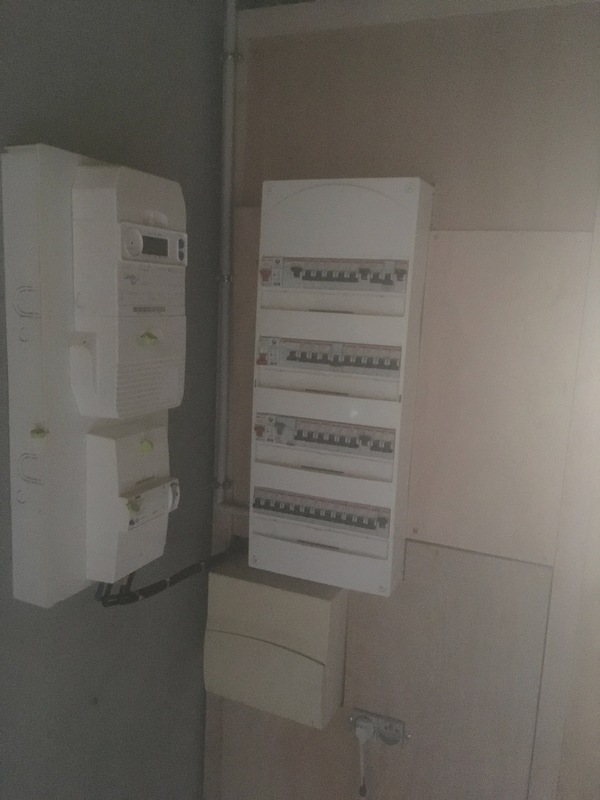 Our other big news is that we have been connected to our real 3 phase electricity supply. 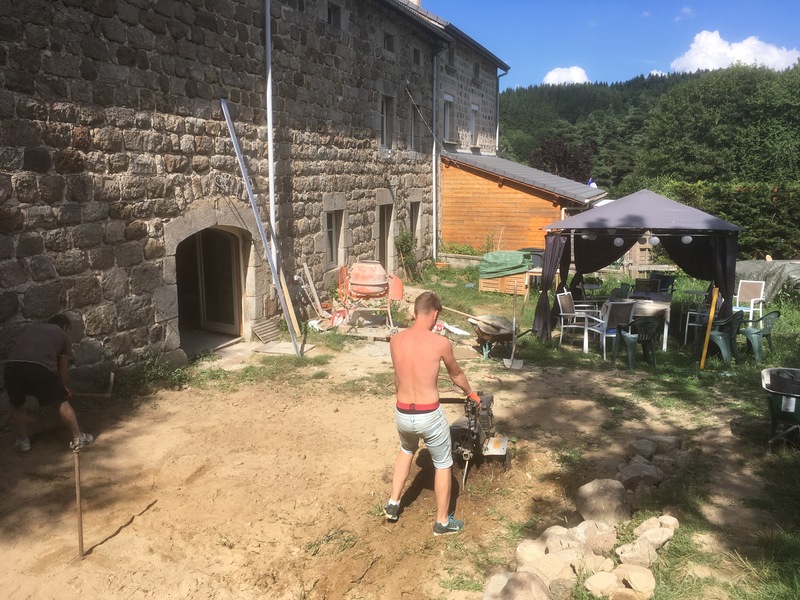 Up until now we’ve had a ‘chantier’ supply – so just a basic feed for the building work – Joe has done an amazing job wiring the whole house – thinking of every light switch, every plug socket that we might need in the future. 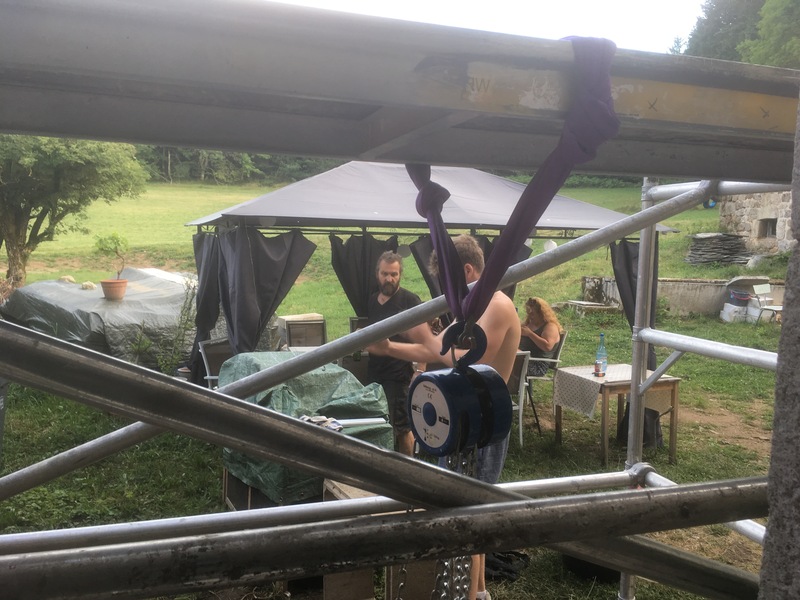 This is his forté , so obviously he was at home doing this – but it was an enormous undertaking to wire the whole house rather than a musical or theatre show!! 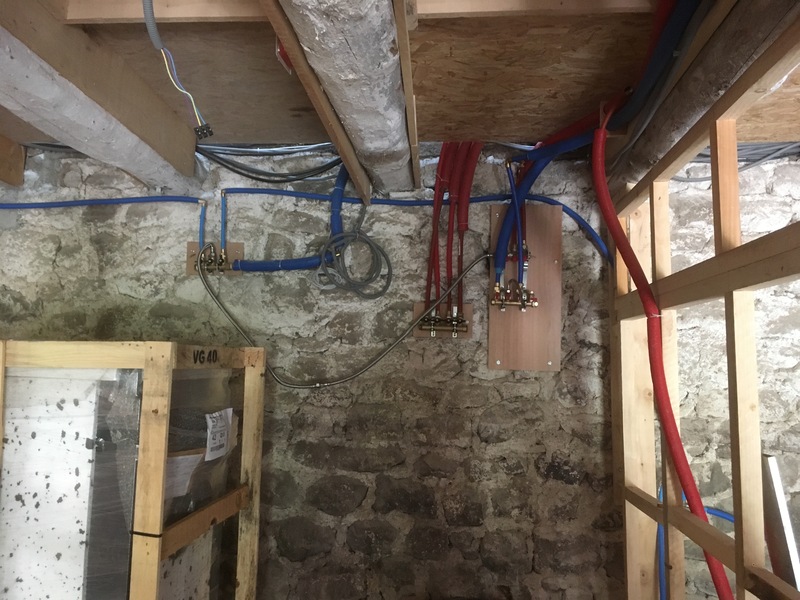 We’ve chosen to have a three phase supply as Joe has some big three phase machines in the work shop. 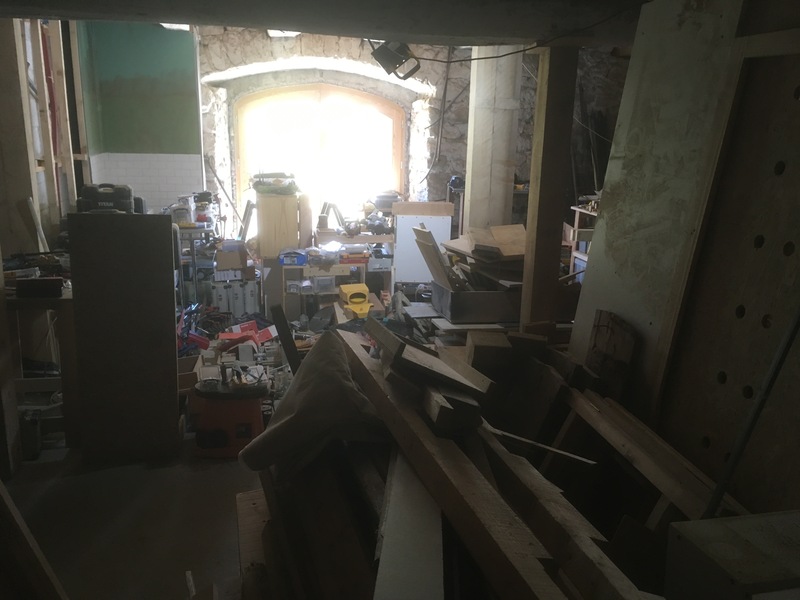 The advent of the new supply has prompted a massive workshop reorganisation by Luke and Joe over the last few days. And all back in, beautifully organised! 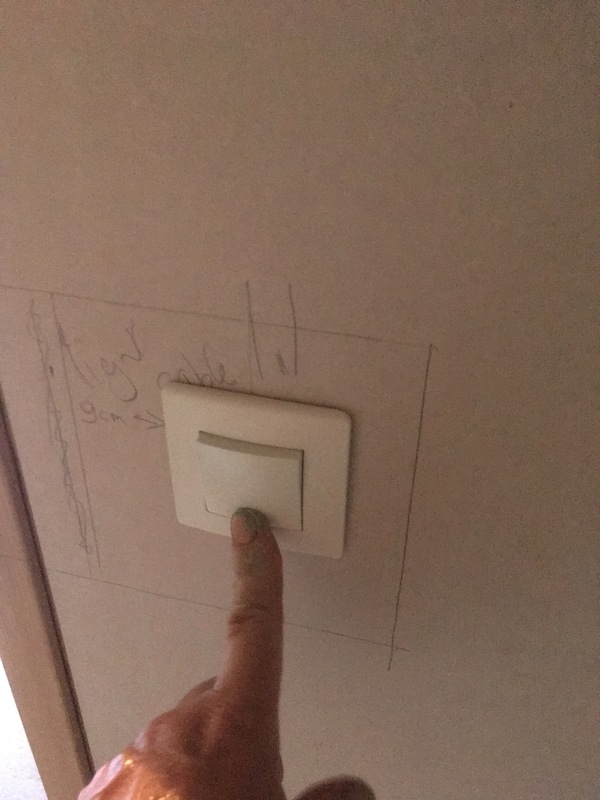 Light switches are steadily being installed all over the place! Look at that expanding foam on my finger… almost impossible to get off! 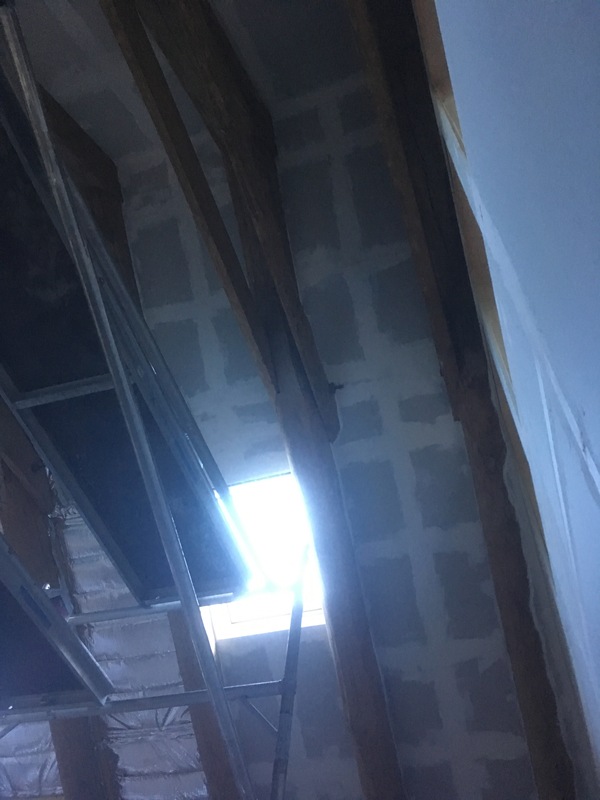 So we need to get the ceiling over the stairwell plaster-boarded and taped up before we can re-expose the hole and Joe can build the staircases! 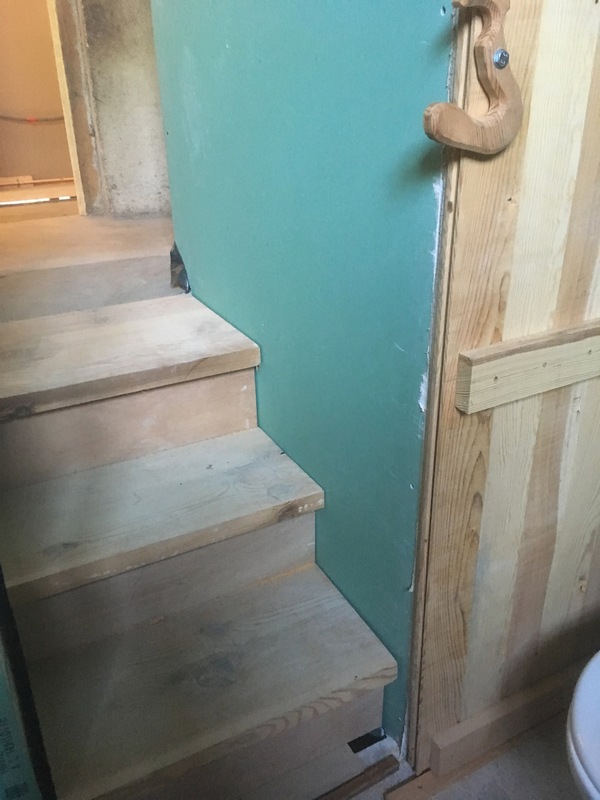 These will be short-term staircases to enable us to move in. When we’re in, he can slowly and carefully enjoy making the final works of art! 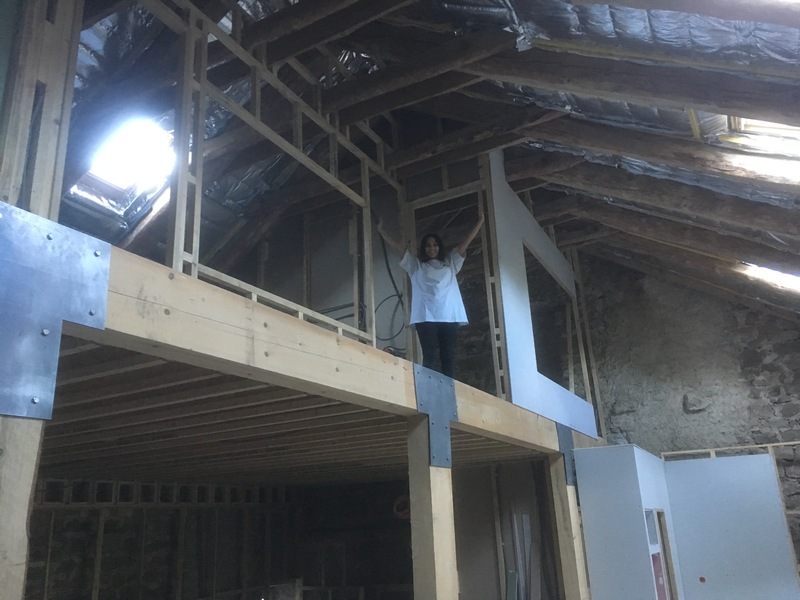 It’s too big and interesting a project to rush, and yet we can’t realistically move in with only a ladder to get to the mezzanine – or indeed the only access to upstairs passing through our bed space! 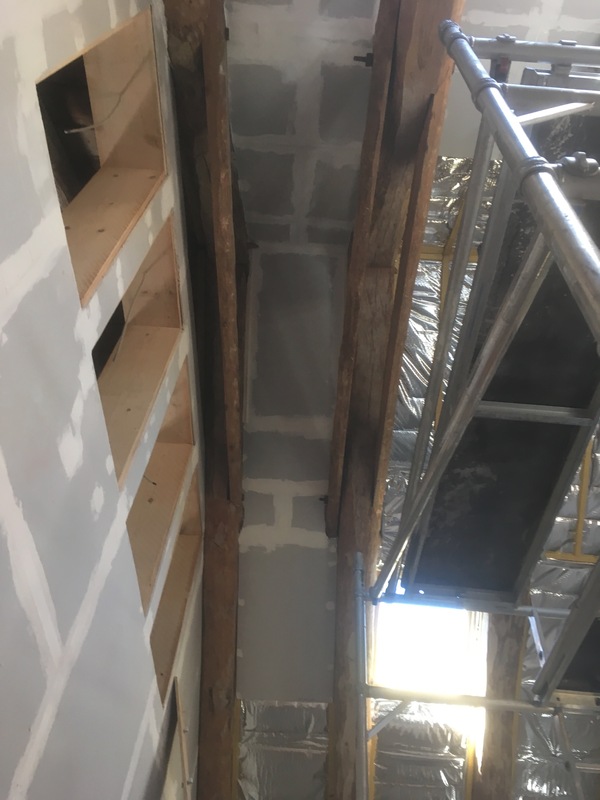 We’re doing well with the fiddly high plaster-boarding – and are really pleased with the effect of keeping our beautiful beams exposed. 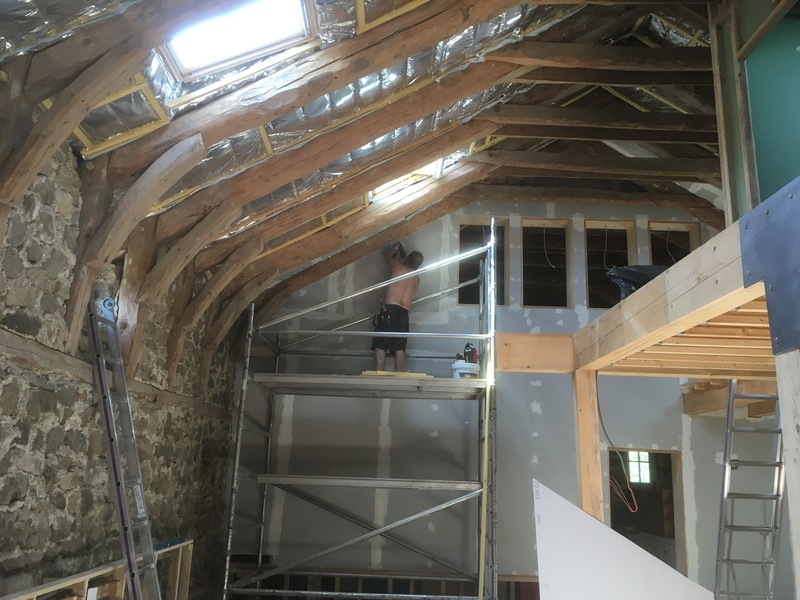 While Joe and Luke have been reorganising the workshop Marie and I have been cracking on with the ceiling. 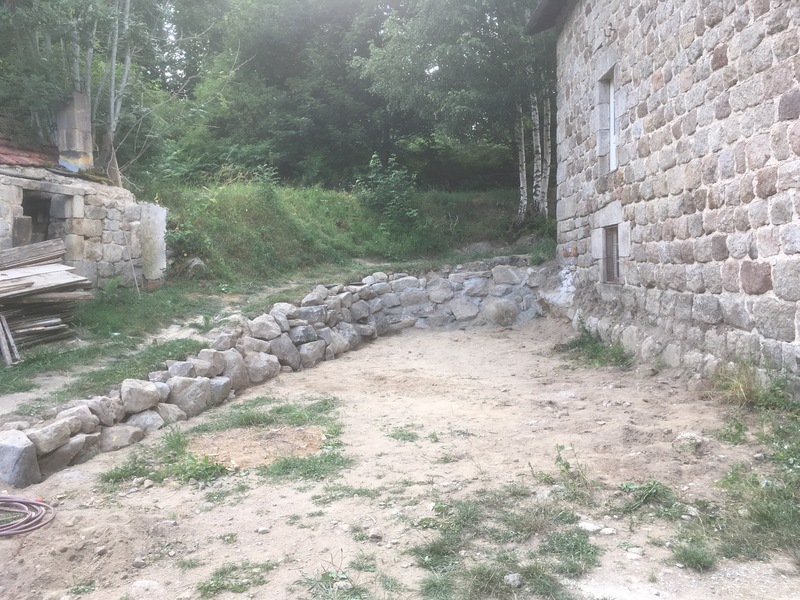 First three bays are now completed on the South side… only another 11 to go, and then it’s over to the other side! The tower yet again indispensable for accessing all the high places! 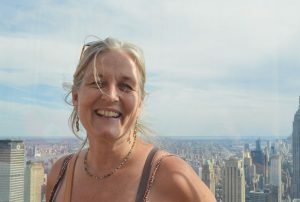 I feel so at ease up on the tower now – would never have believed it when we started! 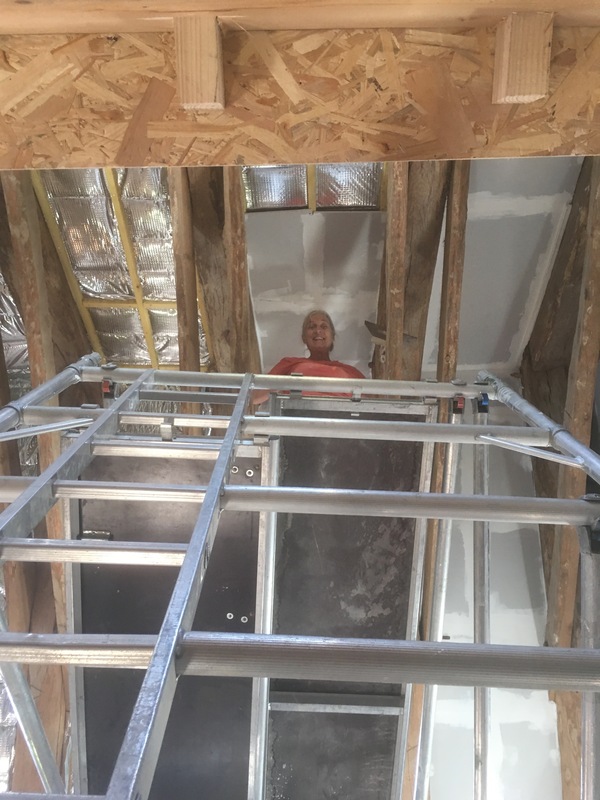 Marie on the mezzanine after a great few days cutting plasterboard for me to put up on the ceiling. 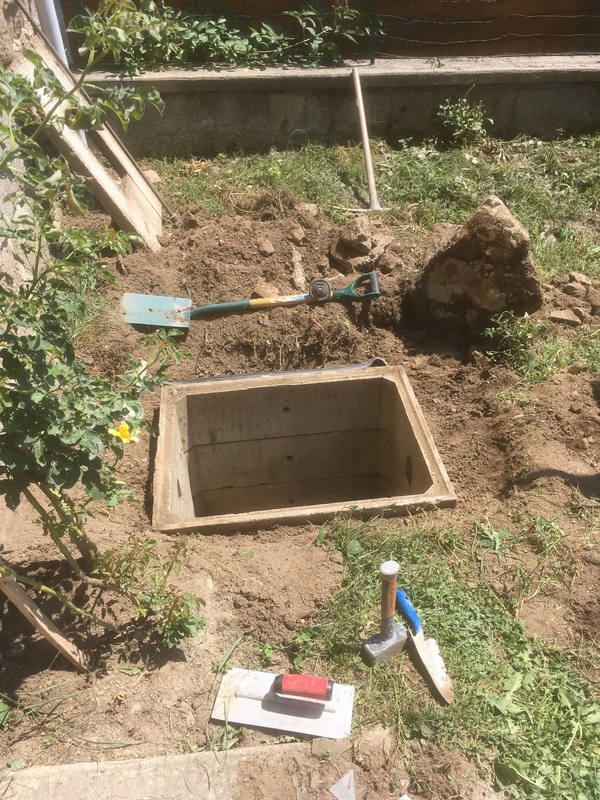 We wanted a small summer pool to cool off in, and the perfect place to put it was in front of the house where the ground was the flattest and the least stony. 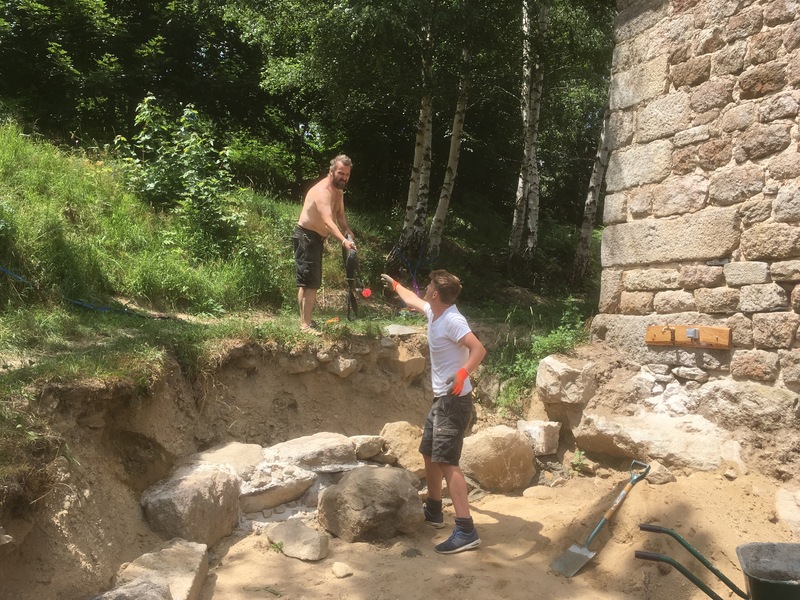 The only hitch was that the huge pile of rocks destined to become the retaining wall was in the way… So Joe and Arty moved them… and started to build the wall! 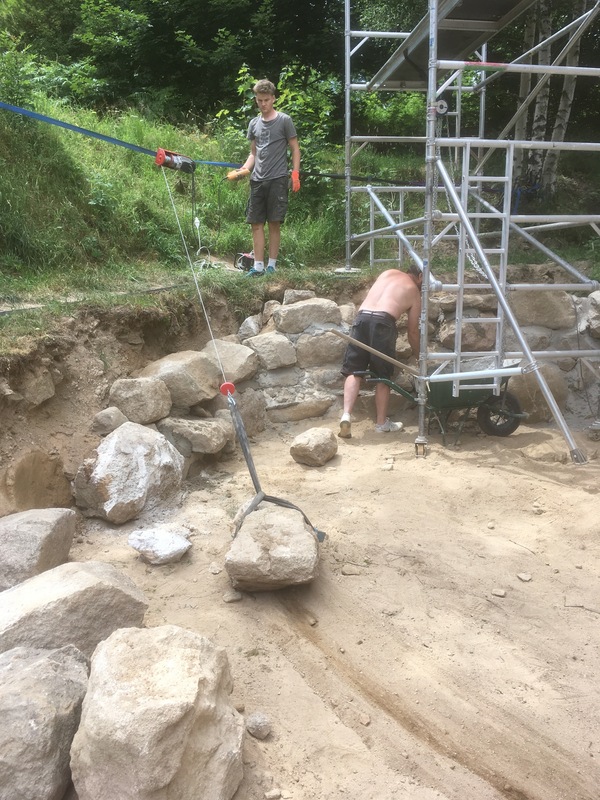 The mix of brains and brawn was a sight to behold – this must be how the pyramids were built… or indeed our house all those year ago! 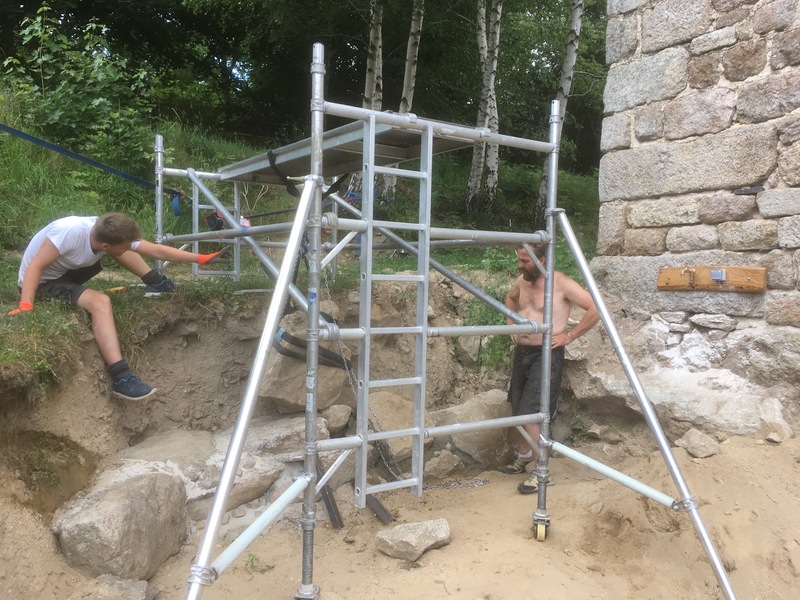 We used the tower and the chain hoist to budge these enormous rocks, and the wall started to take shape. It looks gorgeous – like it’s always been there! 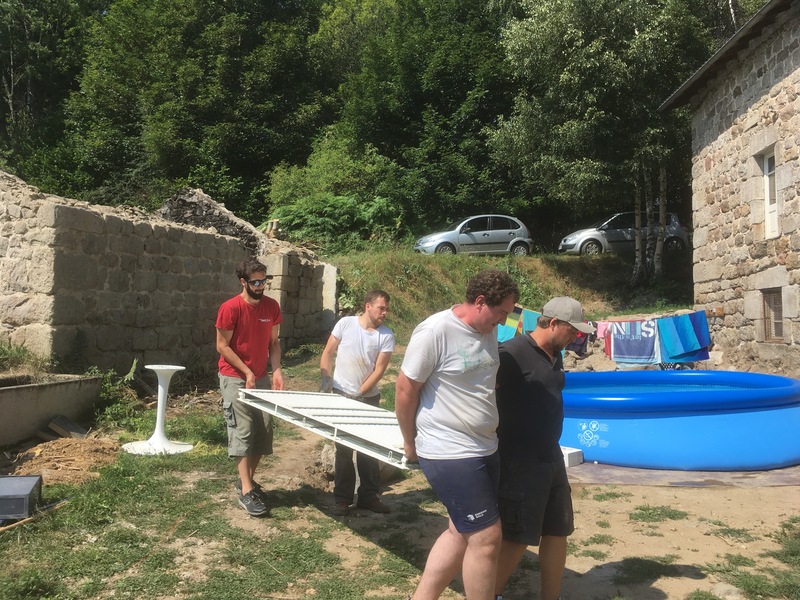 The ground was properly flattened, de-stoned, and levelled with extreme precision – we set up our pool and have absolutely loved cooling off many times a day throughout this glorious heatwave summer – the heat really has been a total pleasure here, with gentle breezes, occasional storms to clear the air, and cool fresh nights. 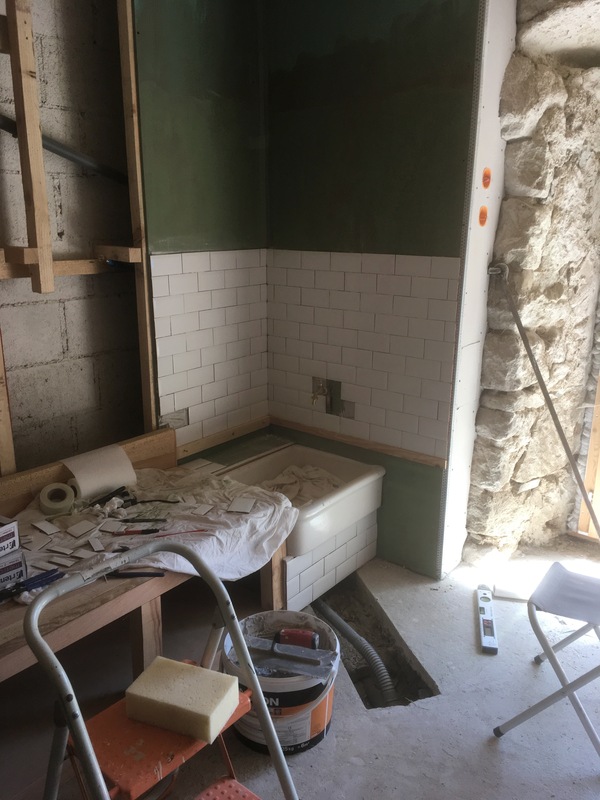 I’ve watched a few YouTube videos and braved the tiling of the porte d’entrée, with it’s beautiful wooden boots bench and old butler’s sink. 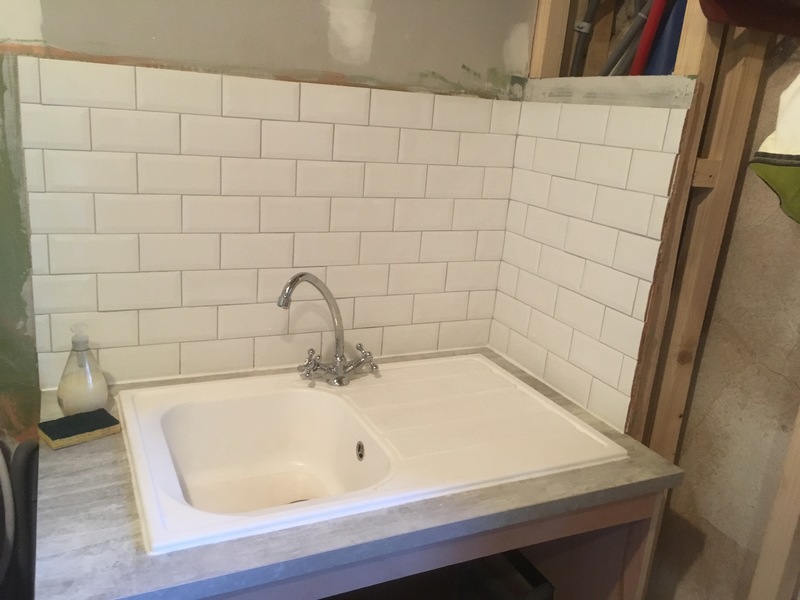 For a few days this was the only running tap inside so we needed to get it tiled up and watertight so we could use it! 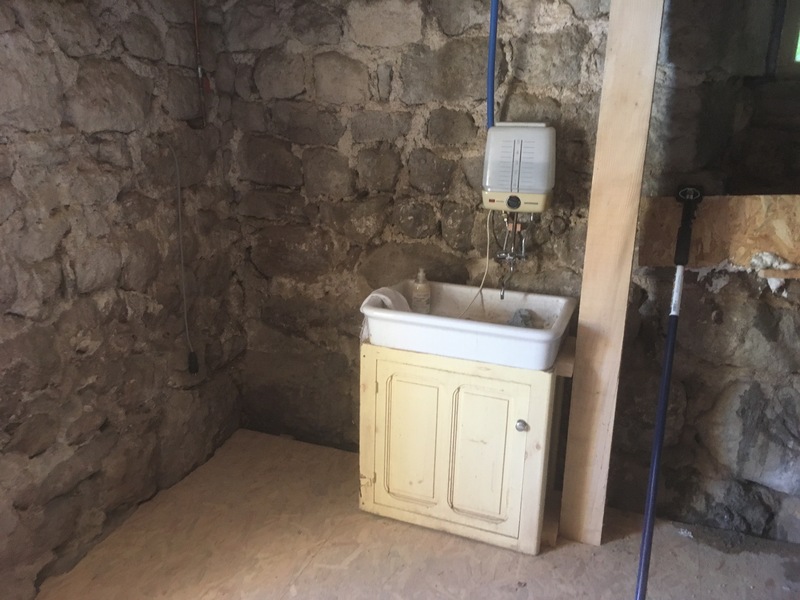 The same thing was necessary in the buanderie – where the newly installed sink needed to be ready for the first visitors, Beth’s friends. 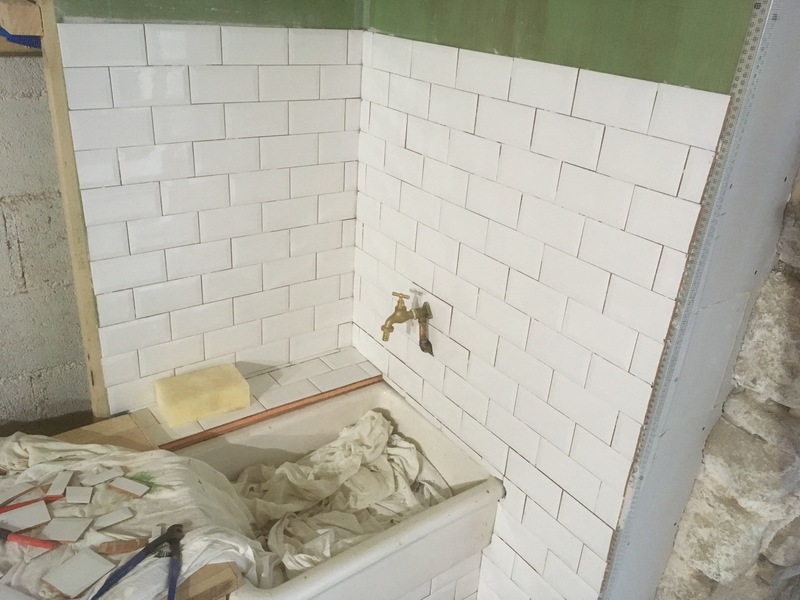 Both areas are now tiled and grouted … and I have to admit to being really pleased with the results! 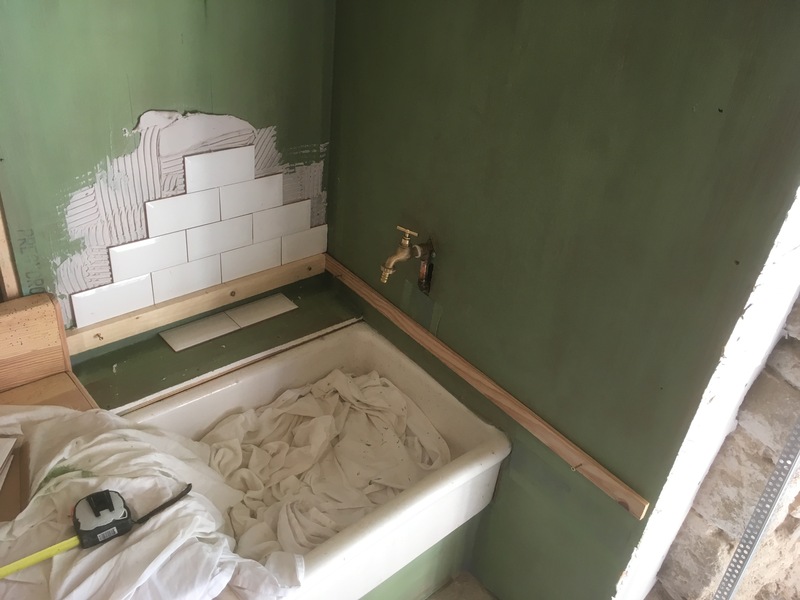 I love tiling! Who knew! Good thing as I’m on to the shower and bathroom next! 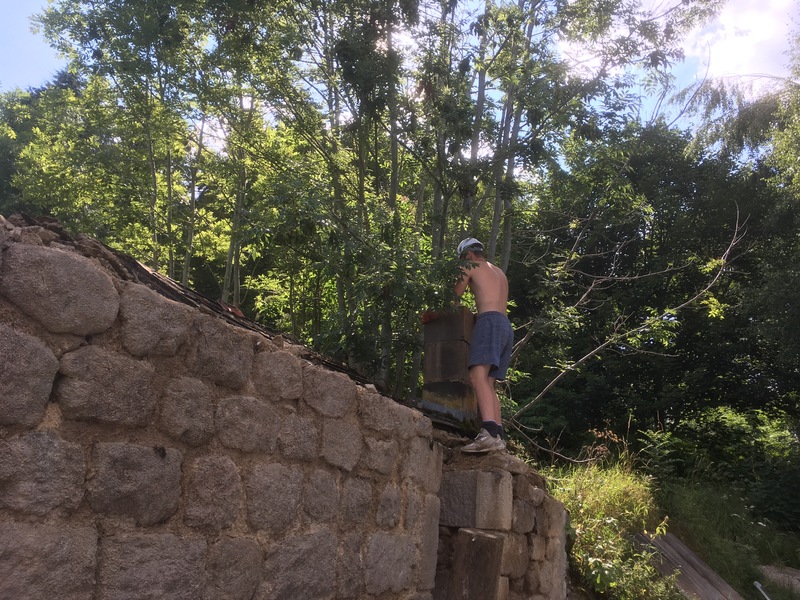 We took down the tiles from the piggery roof as the roof has been threatening to fall in at any moment after the last heavy snow. 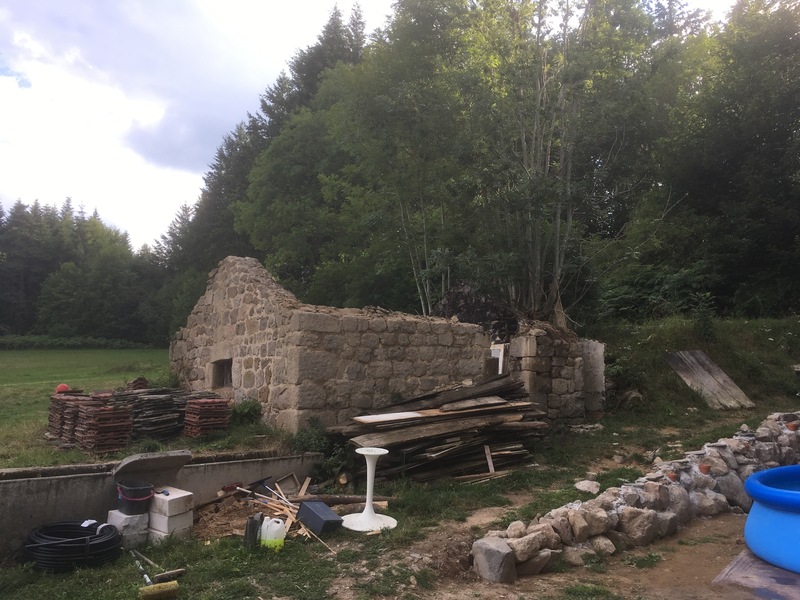 It was a big job with lots of safety considerations – it all went smoothly, and the view from the house is dramatically different as we also cut down the overgrown trees around the old stone walls. 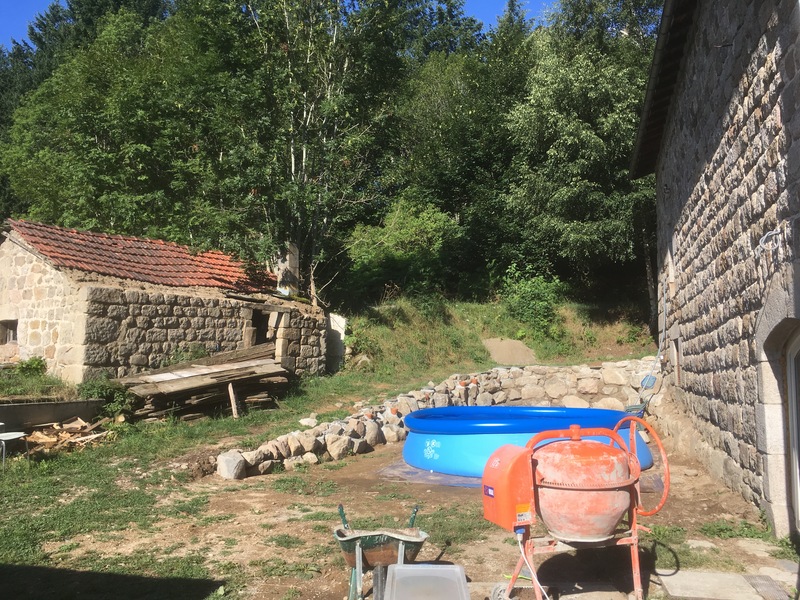 Long term we plan to use the four walls to make a dreamy swimming pool! Watch this space! 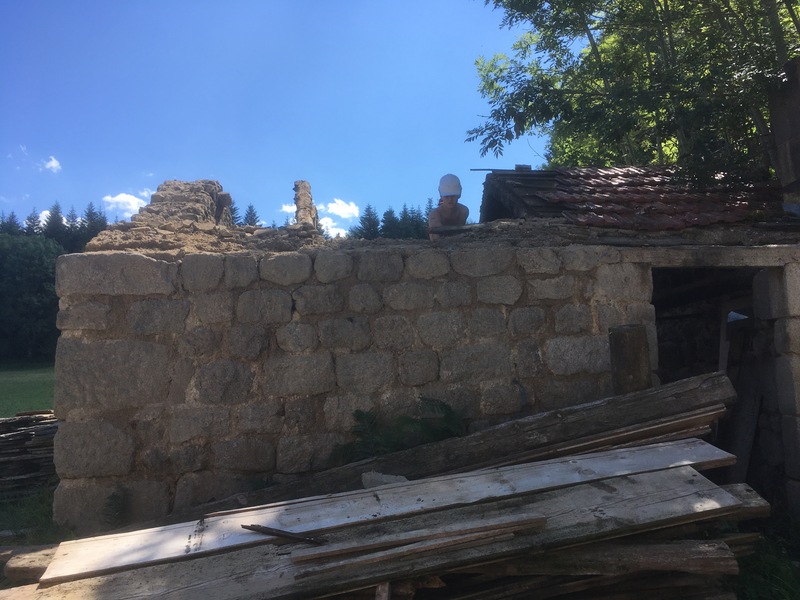 Roof off…just in time – it was definitely close to falling in! Or utility room! 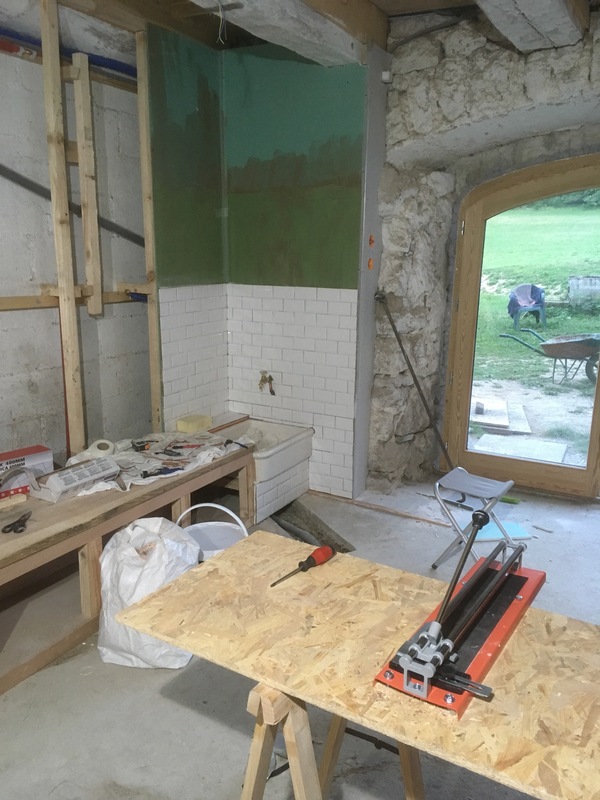 The buanderie is currently serving as the kitchen and will do for a good while I suspect as we build and create our kitchen upstairs. 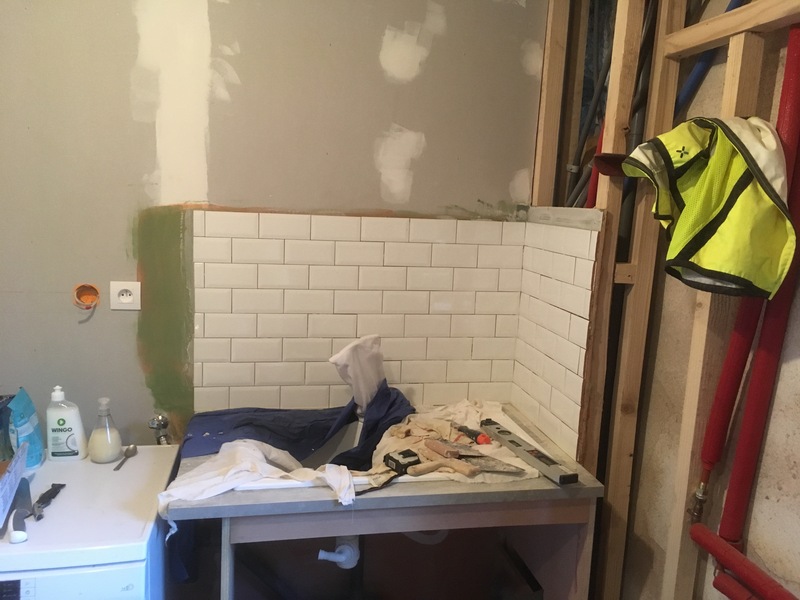 Rather comically it has a dishwasher – a brilliant idea of Joe’s as it only uses cold water and we currently only have cold water, (until the heating is installed… soon we hope – the boiler has already been delivered!) 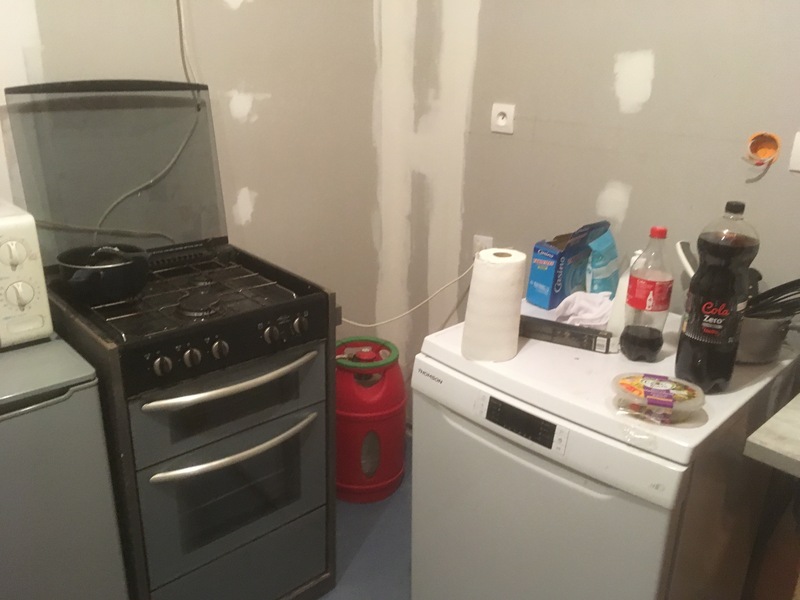 The dishwasher was sitting in storage upstairs, so we carried it down and plumbed it in! 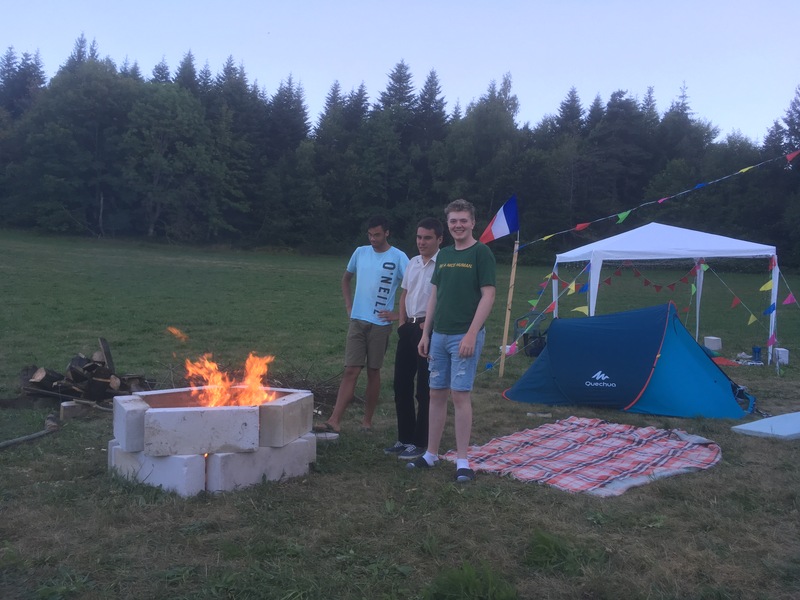 It has worked brilliantly with the camping gang! 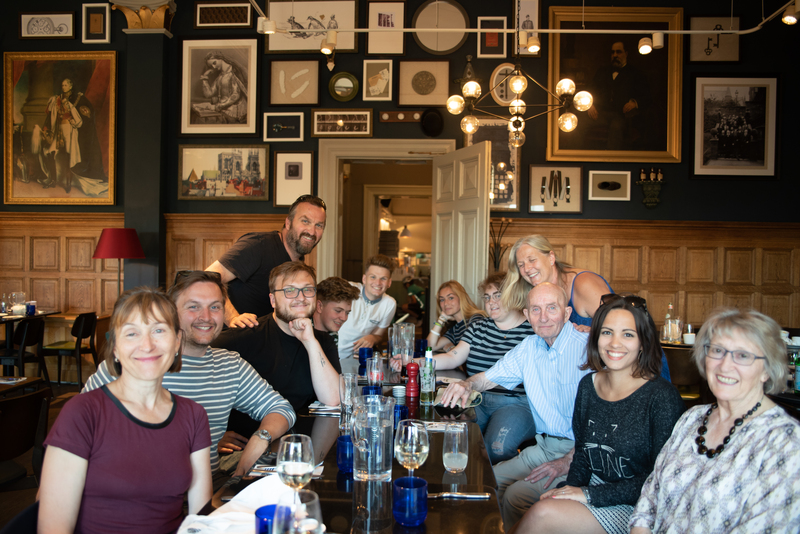 Yet again we’ve been blessed by a weekend of help from Luke and Marie’s friends -so generous! 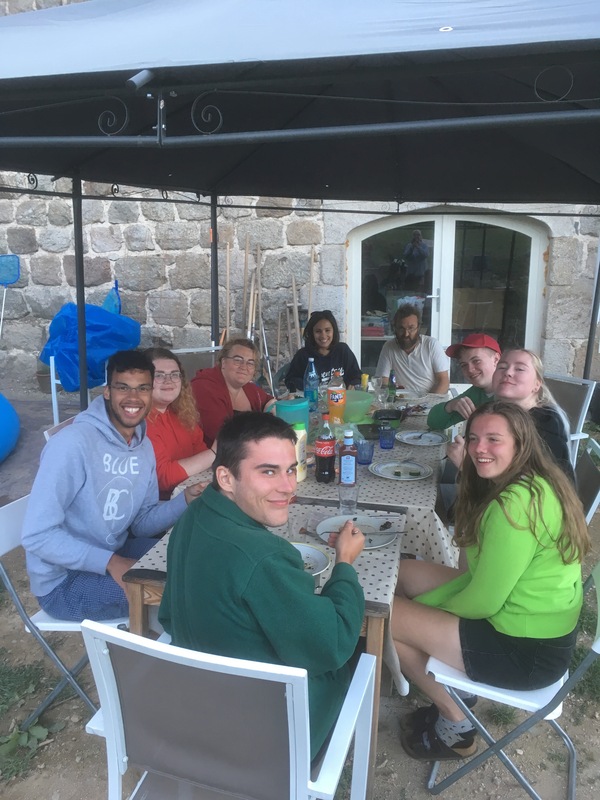 They came and helped with some heavy stuff – spent the night in the tents before Beth’s friends arrived – and put in a second shift the next day. Such a boost! 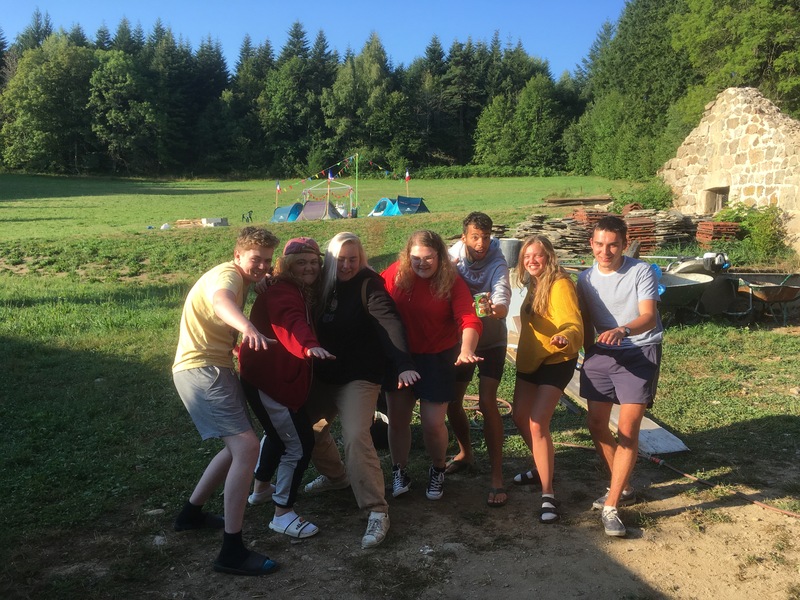 The Secret Seven go Camping! 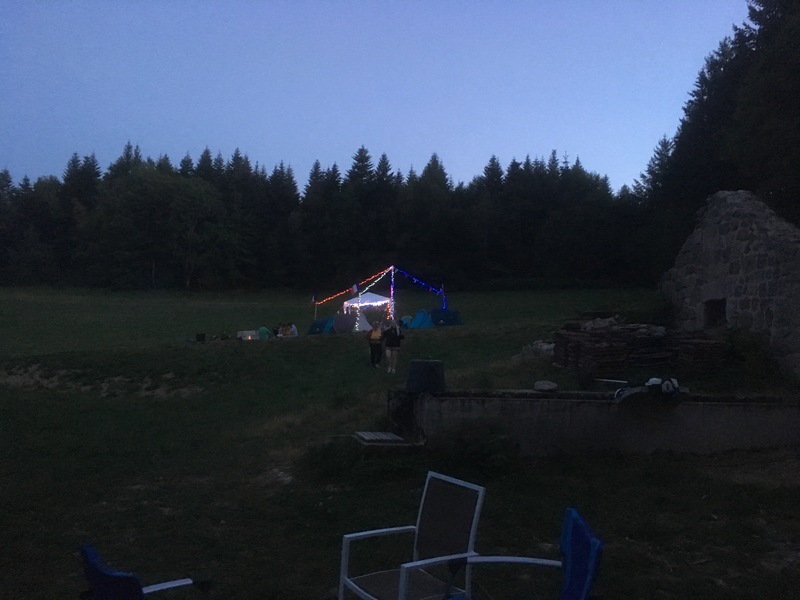 We have the most magical campsite in the middle of the field – Beth and her six friends have celebrated the pleasures of outdoor living. 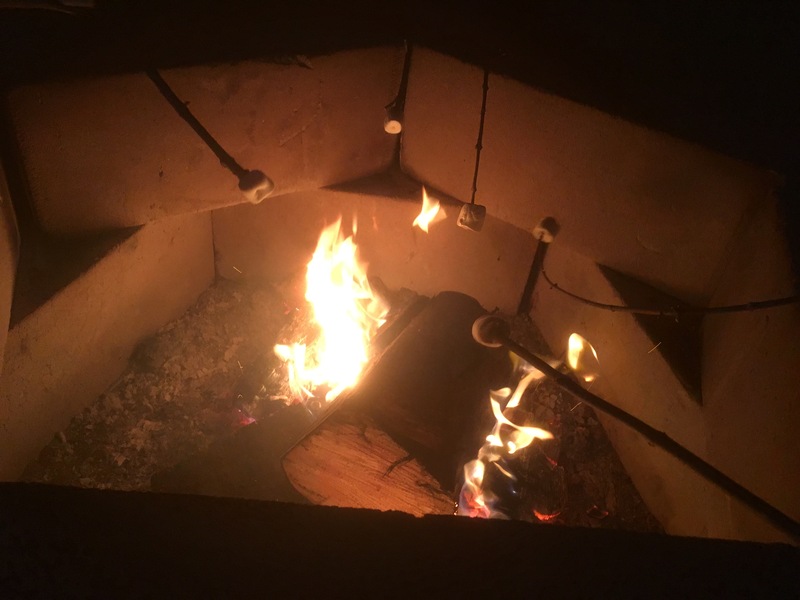 Marshmallows in the fire, swimming in the river and dancing under the stars. Hopefully its the first of many summer camps. 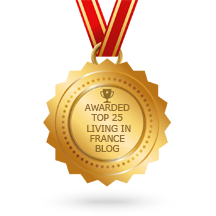 Ha ha – thanks Karen – getting so close to living there now!